Pasta is a wonderful and nutritious meal, especially the one made with whole grain flours, such as quinoa, spelt or other multi-grain pasta. Eggplant pasta is quite a popular dish in Sicily, and the first time I tried this, it was at my father’s Sicilian friend’s house in Milan about 15 years ago and I loved it. Since then, I made quite a few changes to its original recipe and made my own version of it. In the original Sicilian version, the eggplants are fried, I try to avoid any kind of fried item and always substitute the frying part with grilling or broiling cooking method. For this dish, I used multi grain flax seed penne and fusili. I wanted to mix the two to give more character to the dish. If you want to mix two different kinds of pasta shapes, make sure, they’re made with same flour, and from the same manufacturer. In addition to its nutritional qualities, it’s beautiful golden brown color, its natural nutty taste is really a delight. The spicy tomato sauce with grilled eggplants and melted fresh mozzarella adds up to this multi-flavor dish. Heat olive oil in a pan and add crushed garlic, let the flavors come out but do not burn, then add some shredded basil, stir for about 1 minute, then add the previously seeded and peeled tomatoes and the chili pepper powder. In the meantime, cut the eggplant in 1 cm thick slices and drizzle with some olive oil, salt and pepper and broil in the oven. When they’re nice and brown on both sides, take out from the oven and cut in smaller pieces. If the eggplant is large, you can cut each slice in quarters. When the tomato sauce is cooked and the water has been evaporated, about 15 minutes or so, add the eggplants and the olives cut in smaller pieces. Add salt and pepper to your tastes. Cook pasta al dente. 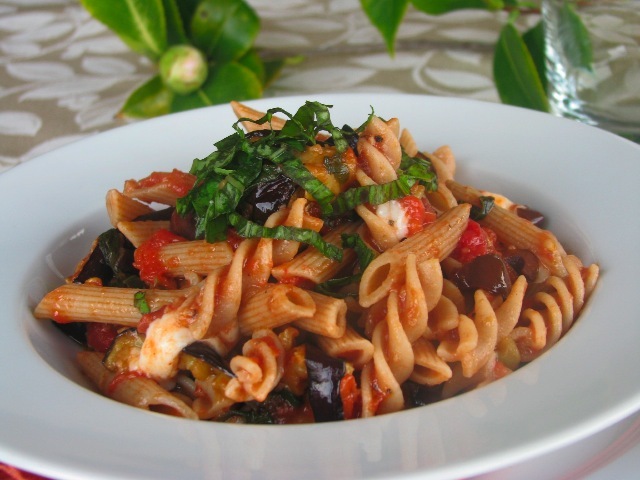 On a pasta bowl, cut the mozzarella in small pieces, add some shredded basil, and when the pasta is cooked, add it to the bowl, then add the tomato/eggplant mixture on top. Mix well and serve hot. This entry was posted by silvia on December 16, 2008 at 9:43 pm, and is filed under Pasta. Follow any responses to this post through RSS 2.0.You can leave a response or trackback from your own site. That sounds so delicious! I love the simplicity of it. The pictures are gorgeous too.